Each February half term we take a group of students on a ski trip to different resorts within Austria. We find that Austria provides students with excellent value for money, superb snow and ski conditions and extremely hospitable accommodation.The trip is offered to those in Years 9 to 13 and offers students of all abilities the chance to experience six days of skiing lessons. Throughout the years we have had students who attend trips on consecutive years. This is commonplace and illustrates the enjoyment students experience on the trip. We have been running ski trips for over 10 years and are able to use our knowledge of the Austrian Alps to select new and appropriate bases each year. The trip offers a fantastic opportunity to discover a different culture and sample the experience of skiing abroad. Each trip includes five or six members of staff. They are all experienced in taking school trips both at home and abroad. 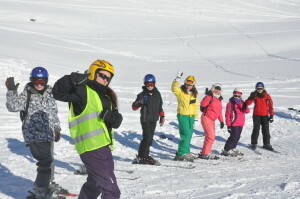 The staff members attach themselves to a different ski group to provide extra support to students during ski lessons. Evening entertainment is a big part of the ski trip and we go swimming, bowling and enjoy pizza evenings during the week. On average we take between 40 – 45 students on each trip. This means that during the ski lessons, students are split into groups of approximately 10/12 students per group allowing for excellent progress throughout the week’s lessons. Lessons take place on a variety of slopes from Nursery to Black and most students make significant progress throughout the week. Students also see an excellent level of progression when attending more than one trip and often move to higher level groups. The accommodation we use is a single-occupancy family run hotel. Though we change resorts for each trip we always ensure that the accommodation is single-occupancy to give us sole use of the hotel. The accommodation includes breakfast and a three-course evening meal, with a hot lunch provided on the slopes during the day. 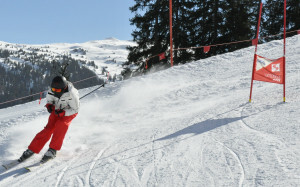 Students in Years 10 & 11 have often used Skiing as one of their assessment subjects. This involves students being videoed whilst on the trip. This is then organised and graded as part of the GCSE PE Controlled Assessment. This has become a very useful way of students improving their grades whilst experiencing a fantastic school trip. Payment for the awards can be made in instalments over a period of time. Our online payment system is the most efficient way to pay and allows parents to keep track of any payments made and any outstanding amounts. Payments can be made as and when convenient as long as the final deadline date is adhered to.